Some of you may recall this image from some time ago? 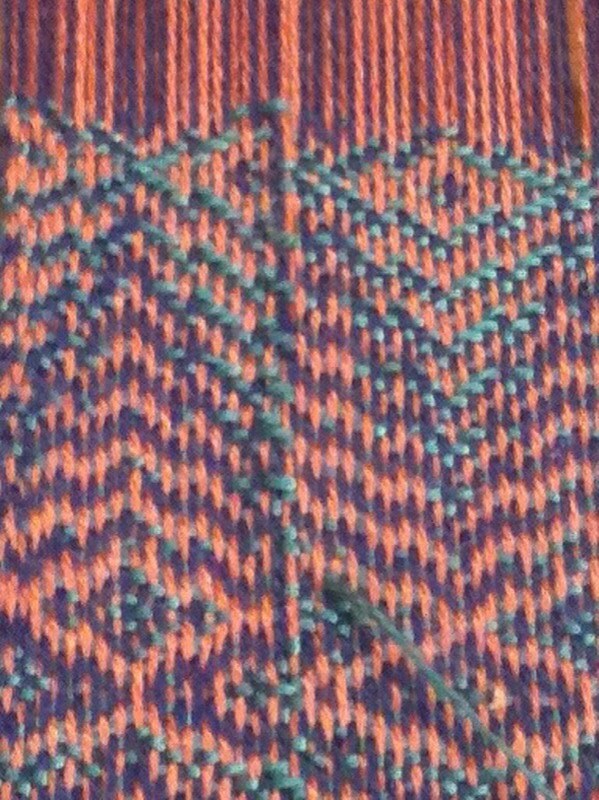 I started this warp back in the spring and it was supposed to push my colour boundaries. It did just that and nudged me (obviously) a bit too far and sat waiting for me to pluck up my courage! I played with the Louet Spring in the interim and did a fine job of not seeing a large gorilla frame loom with a big foot print in the room. The project is to try my hand at echo weave and you may find more on the original project by Lynnette here. I didn't want to copy her warp colours and after consulting with the Itten Colour Star and checking many cones, I chose to use alternating ends of 8/2 tencel in iris and coral. This means the third colour for weft would lay in the greens if you view the triadic colour wheel. So for my first choice I chose aquamarine which is a turquoise. I got it under way and after much scrutiny I detected no threading errors, which was good as its a difficult draft to follow along. It jumps all over the place as the computer program has expanded and elongated a normal draft, so the threading sequence is hard to follow. 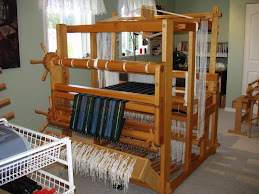 The sett is quite dense at 40 epi and the pattern uses a full 12 shafts and 12 treadles. Out of the three various drafts, I chose the one with the easiest treadling for my first time and its a series of twill runs. I'm not 'feeling the love' for the colour mix but after sending Lynnette a picture and a phone chat, it was agreed that I should carry on and that it gets better once washed and off the loom. Okay.... so 42 inches later something weird happened! See the left hand side in this picture above? There appears to be nothing wrong... no lines, no obvious problem? Just let your eye flow over the general pattern and then somehow errors can pop out. Like here.... after 42 inches woven and approx 1 inch in from the left hand side, I suddenly got a line. A very obvious line. I checked the threading and it was correct. I thought perhaps the four ends per dent in my 10 dent reed was the issue? Nope. I unwove, and rewove... there it is again. So I cut the entire 42 inch long section off the loom. Snip, snip! After it was laying flat on a table waiting for me to do something with it, I played on Lilibet and mulled the problem over. Then one day I walked by the table with the sample and saw it clearly! Can you see it in the picture above? I had picked up the wrong colour in the sequence when threading! That's why the threading was okay and still had made a line. So perhaps this occurred to some of you earlier but please remember that I had a kitchen reno under way and a Dad who had just taken horribly sick so perhaps a bit distracted? We won't even mention the 'mental pause factor'. So now I have generous samples and reworked the last inch or so of the warp. Tied on and got busy with weaving again. Turquoise didn't appeal to me once more, so I went a bit darker and tried a dark teal weft. I called this the seismic look as it reminded me of the charts created when an earthquake hits and the needle goes flying! The second scarf I wove with lemongrass and while very bright, it somehow seemed a better fit. 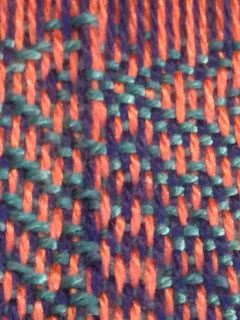 Due to the thickness of the sett, I inserted matching coloured sewing thread and used that to hemstitch with to reduce bulk. 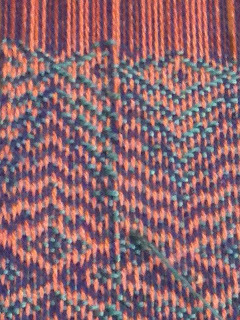 The overall look and appearance is much like a heavily stitched double weave, with one side predominantly weft and the other warp faced. Here's the lemongrass weft scarf on the fringing board and the pattern effect (with a slight change in treadling) making it look like feathers. Here's seismic on the board . Coming off tension the pattern somehow tightens up. The fringes were twisted and some beads added for flare. Then into the laundry tub for a good soak in warm soapy water then air dried on a rack outdoors. Put our then heat wave to good use! A hard pressing with a steam iron, then comb and then rotary wheel cut the tassel fringes and now they are ready for their close up's. I would like to add here that despite the dense sett, the scarves are quite drapeable. I put that down to the tencel and having made them in a narrow width. Tencel is a weighty yarn, so they have 'substance'. :) Now that I have seen the final outcome, would I weave these again? Yes, but be much more selective on the colour selection! It will be interesting to see what sort of personality type will buy these at the coming sales this fall! I know this post is some what late but we have had a hectic but very enjoyable time in the last week and I'll share it with you now. So be warned this is a long post and lots of pictures! My hubby has been in discussions about a new job position and things are looking good. The General Operations Manager invited both of us to come over to Vancouver this past week and stay in the corporate suite. We didn't know what to expect so I packed *everything* and booked the dog into a kennel and reserved our ferry ride over! The condo is way up on the 23rd floor complete with 24/7 concierge. The building looks curved and is curved! I have a few pictures of the inside for you. Briefly, it has two bedrooms. two bathrooms, laundry, computer room, living/dining room and kitchen and is roughly 1200 square feet over all. This bed was like sleeping on a cloud! Despite it being so large, we still somehow kept running into each other. Why is that?? The ensuite bathroom was huge and very enjoyable! 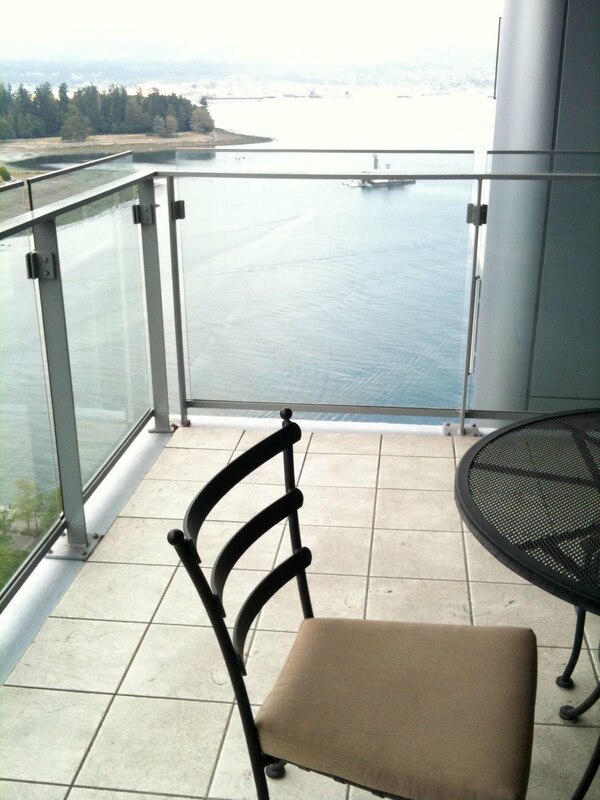 The patio is accessed from both the bedroom and the living room. The glass railing sure tests your 'dizzy factor' ! I found that if I held the rail top I was good. I only had an issue if I stopped to think about it, so I quit that right away! I needed to pick up some groceries (COFFEE!) and so headed downstairs and across the street to the local neighbourhood grocery store. Here I'm sitting at a restaurant bar above the grocery area eating a late lunch and below me is a rainbow of colour. 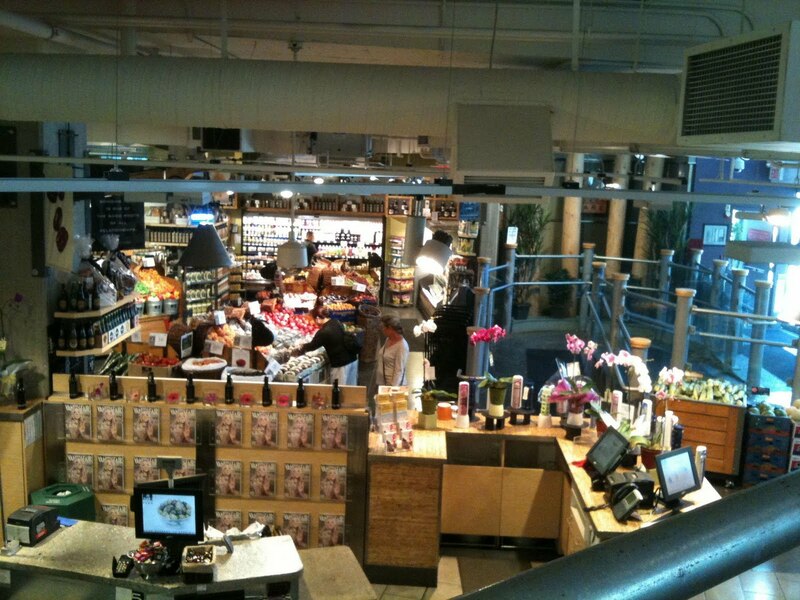 Flowers, orchids and some of the nicest produce I have ever seen. So I headed back with my two bags of goodies, put them away, and then started taking pictures of the view! This is the board walk along the harbour. Those dots are people! 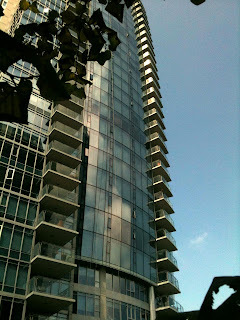 (click to enlarge) The blue glass is the high rise next to us. 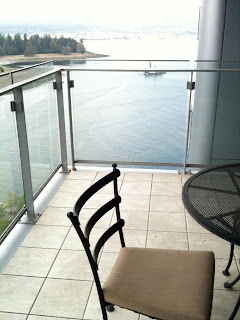 If I pan outwards more, then you see the Westin Bayshore Hotel. I can recall it being quite famous in the 70's for housing billionaire recluse Howard Hughes for almost 2 years, late in his life. I guess he liked the view too. Back to the view: beyond the hotel, you can see an older building on the edge of Stanley Park. 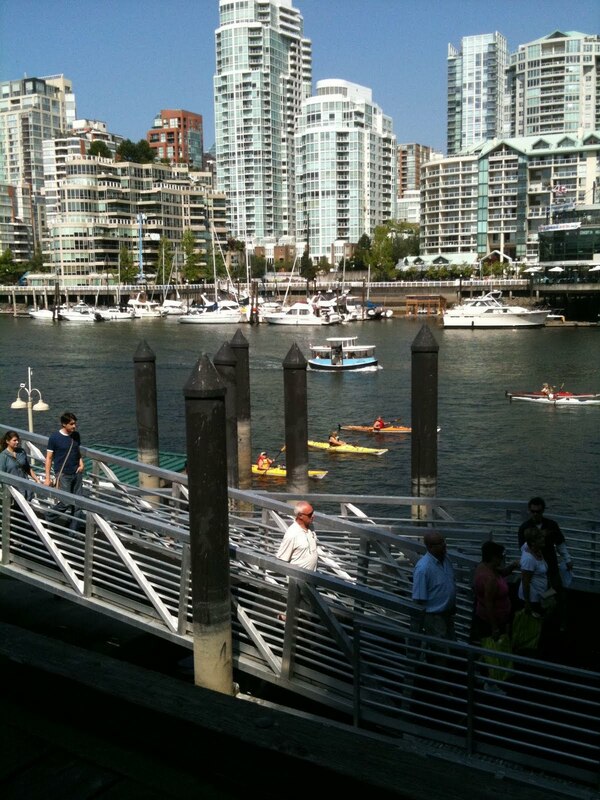 This is the Vancouver Rowing Club. I saw many rowers out getting some practise in over the days we were there. Many years ago....I attended a function at the Rowing Club and can tell you its a classic inside as well as out. It had that classic 'British Gentlemens' Club' feel to it. Then there were the boats, yachts and other craft on the water! Here's the paddle wheeler coming in with a load of tourists who have enjoyed a 2 or 3 hour cruise on the harbour. That vessel really moves! I was surprised by its speed. cruise ship on her way! Then came the cruise ships! This is one of the Norwegian Cruise Line vessels heading out with a whole load of happy people on board. Most likely going up the coast to Alaska. There was another cruise ship but I didn't have my camera handy and it was gone when I got back. I left it on the table after that! There were freighters coming and going blasting their horns... and the 9 o'clock gun that blasts every night at, well strangely enough, 9 o'clock! If you enlarge the cruise ships picture (or any of them in the post to see detail better) you will see a small structure on the point of land on the left. That's a little house built over a traditional cannon. It sure caught me unawares the first night! 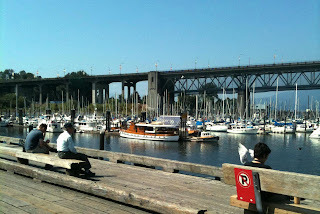 Twice a day, for what seemed like hours, there was a steady parade of float planes taking off and landing. 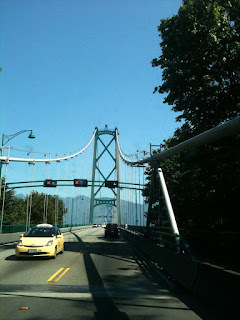 They are ferrying passengers between Vancouver and Victoria, Vancouver and Saltspring Island and other places as well. You could see them coming about 3 minutes apart and landing right in front of the building. Yes, there was some noise but its much the same with cars. Some you hear, some you don't. It all depends on the engine and where they landed. It wasn't bothersome and added to the image of a city being 'alive'. Then there were the buildings and unique views of them from this height. I don't think I had ever looked at them quite like this before or admired them as large 3D art forms. One thing I noticed was the liberal use of plants and gardens to bring nature into the city and soften its harder edges. Here's a terraced building up the street at Hastings and Jervis streets. 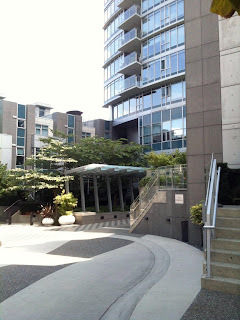 There are town homes at street level with rooftop gardens. Not seen in this shot is the children's playground which was much in use. Children living and going to school in the heart of a business downtown area. It challenges the suburbia concept doesn't it? Below was what looked like a flat egg where this man was playing with his dog; to the right with a glass roof is an indoor pool for the building next door. I never saw anyone in there swimming.... pity! Later when we walked to Cardero's for dinner, this flat egg is actually a large green dome and sits over the underground parking complex. That's a gym waaay up there! Bruce pointed this place out to me! At the very top of a high rise way off to the east, is a large gym and fitness centre. It must be at least 30 stories up as it was way up above our heads.Those are tread mills you can just see at the edge of the window. Even breaking a sweat here is different! We saw three marvelous sunsets while here. Those mountains off in the distance are on Vancouver Island. I tried some night shots to show all the city lights but I'm not a proper photographer. I use all automatic settings and left that up to hubby. He got some fantastic shots at night but his computer is misbehaving right now or I'd share one with you. We had a full day off together and so headed to Granville Island! 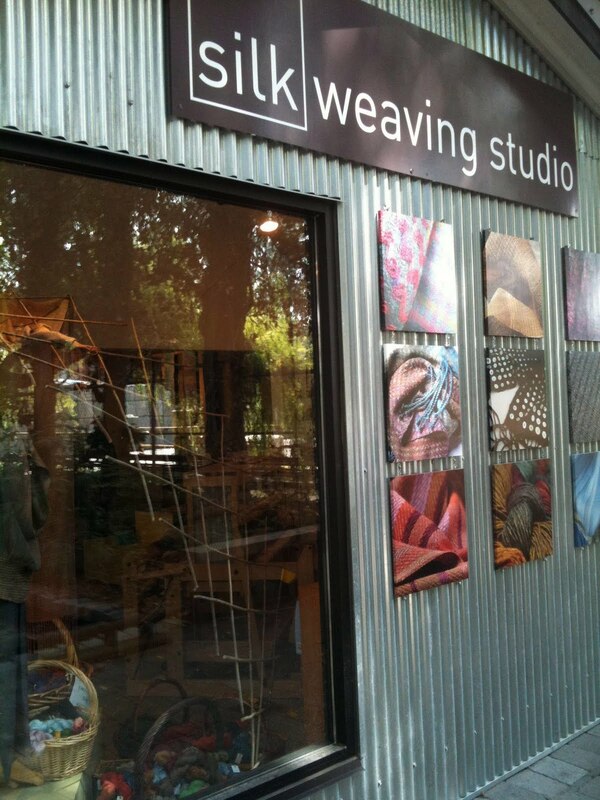 This was one of my key places to visit as I have just about used up my 30/2 black silk. 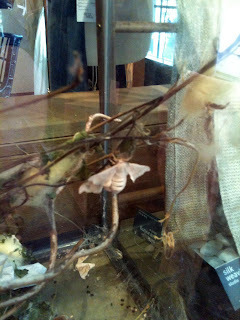 I bought a cone of black silk and also a cone of 20/2 bombyx silk. That was it... and that was damage enough! I just wandered around taking pictures. Now isn't this a sight for sore eyes! 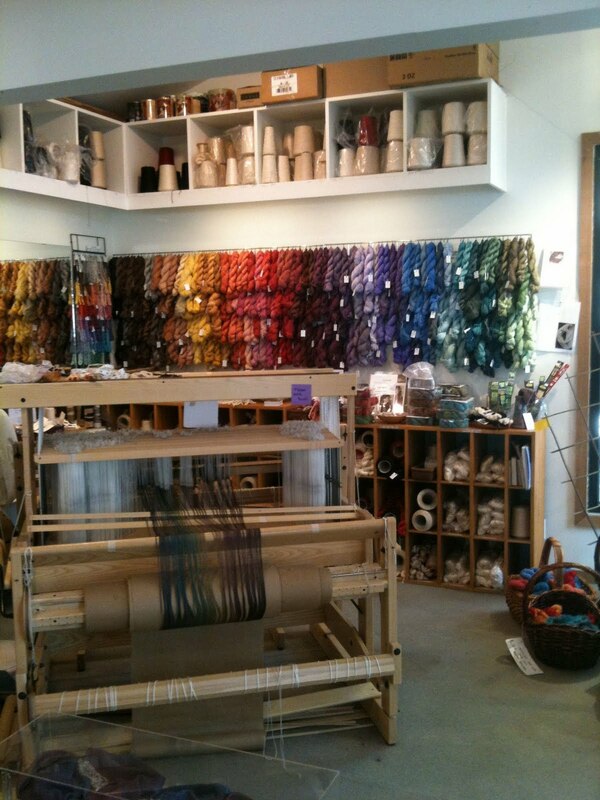 This area seems to be for visiting weavers to get a fix of yarn and colour. There was a variegated silk warp being threaded on the Louet Megado. There was a terrarium with silk moths; some in cocoons. Not sure if they were spinning and going in, or just coming out? Big hit with the kids that came in. I found Bruce and we headed over to another building called the Net Loft and I was going to browse at Maiwa. They sell dye supplies. I looked around and while everything looked wonderful, I decided that I should use what I have already. 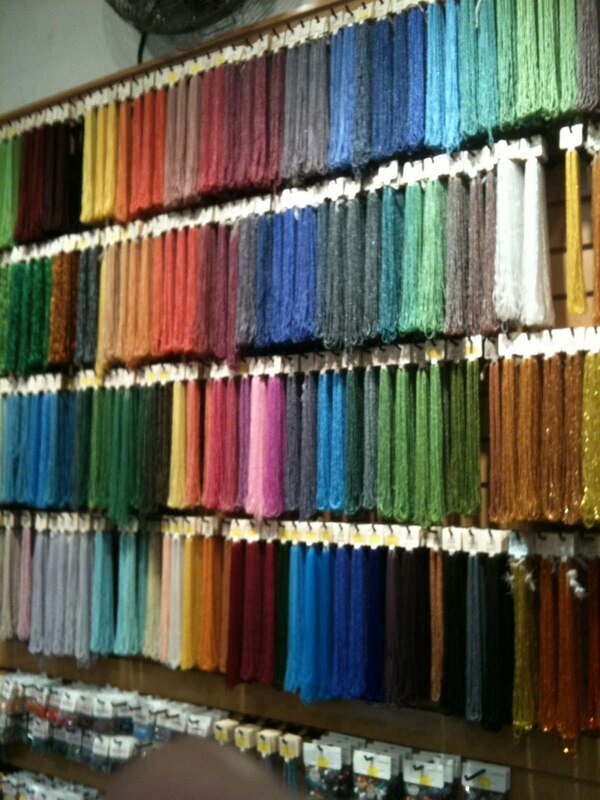 Then I found the bead store! Yes, I have lots of those too but picked up some Japanese Delica beads in cream and an unusual green that will be for my current project on my Louet Spring (to be shared soon). We bought lunch and sat outside watching the people and boats to'ing and fro'ing. Sea gulls everywhere and then we noticed that the gulls had a plan. Rather than wait for scraps to be thrown (which is discouraged as it feeds rats too), they now wait on the roof line and watch people come out with plates of food. If they see an open style plate, they dive bomb the person! Four or five birds all flapping around their head (seemed like ten!) and out of three attacks, it worked once. A poor teenager dropped his plate of chinese style rice and chicken and everyone was in there scrapping over the scraps! Even the pigeons and starlings were jostling for position. Smart! So you aren't feeding us anymore? well, we'll take it all then! If you have ever watched the movie 'Finding Nemo' then you'll understand the seagull chant " mine, mine!" If I had to name this picture, I would call it 'Motion' as people were on the move here constantly, by many means. Meanwhile, some were sitting still, including the boats. 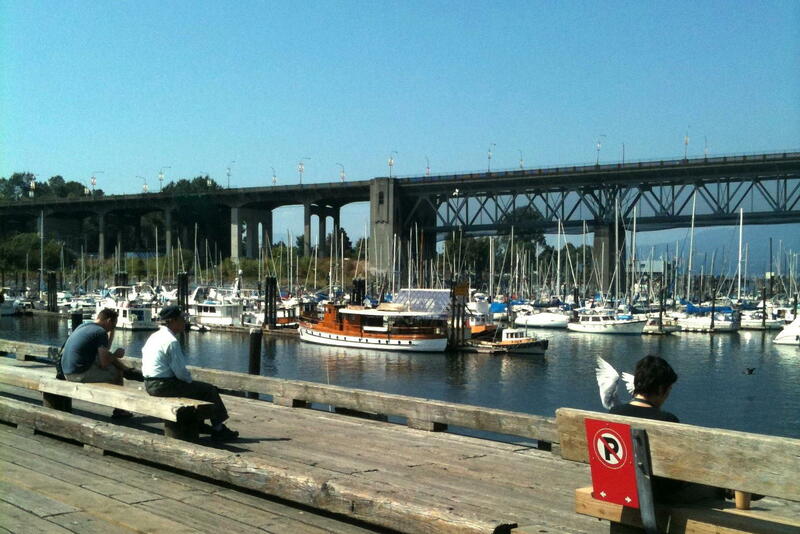 That's the Granville Street bridge that the market and grounds sit under. 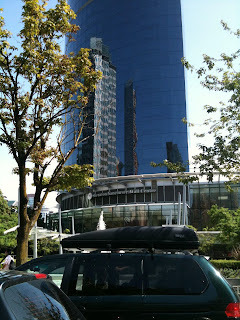 We were in town another few days and visited with family and more business meetings as well. These are some shots taken on the fly from the car with my mobile phone camera. I liked the reflection of the building in the glass of the newest tower in Vancouver, the Sheraton Wall Centre. The reflected building is the old BC Hydro building where I got my very first job at age 18 after coming back to Canada ...oh, so many years ago! Its now been converted into downtown apartments. The outside still looks the same, except maybe not in this photo! Then it was time to head home. I was not in a hurry to leave! I could have stayed even longer....I liked this 'lifestyle' but granted I can't afford it..... The trip home was long and hot as we didn't have reservations on the ferry. I was thinking of that other ship.... it was clearly waiting for me and no line up either! Some of you might recall the story of our little fawn from a couple of years ago. 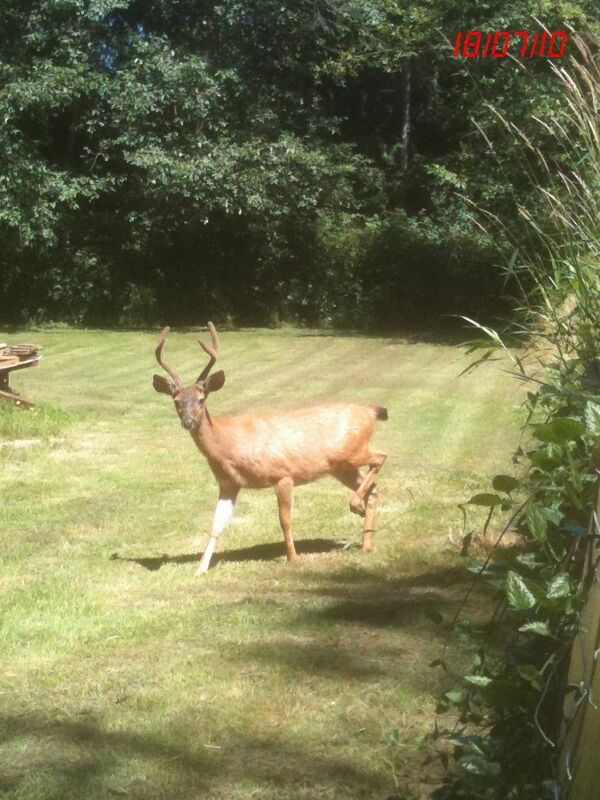 Well, it seems the little nipper has all grown up and likes to call our yard 'home base'. He's also taken to bringing his girl friends along too. No doubt he's waiting for the blueberries to ripen and so are we... it will be a race to the finish and I have no doubt on who will win! He gets up far earlier than we do. Peter, our little solitary bunny is no longer so solitary as Bruce has spotted three other friends down in the lower meadow at times. Most likely doing what rabbits do best..... eat. (what were you thinking of ?!) Peter is the only one who comes right up to the house and sticks around even when we're outdoors. Outdoors here is bone dry. We are under an 'extreme' fire rating and all holding our collective breath. Meanwhile all over BC there are over 300 403 forest fires burning ! (Edited to reflect actual numbers on August 3rd, 2010. It seems 50 new fires are being added daily.) This seems to happen every summer now unfortunately and I'm not impressed with our new 'normal'. The weather reports says we have rain finally in the forecast come this Friday. You can see I'm using new pins with easy pull heads as well. I place one through each warp bout. The grid squares are all one inch. Three weavers went together on one long insulation foam board and so it cost each of us $7.00 for a board that you can use over and over, turn over and use all over again. My pink one is about seven or eight years old. (Then when all used up, you can use it to insulate!) Anyhoo, the fringe twisting went along just fine and now comes the fun part! If you are new to my method, see here. 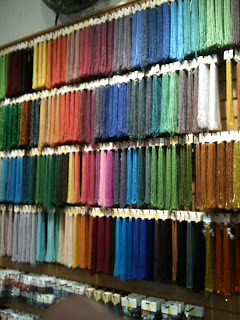 Beading! I want to add a bit of sparkle but not a lot of weight. I want a bead presence but not something that will detract from the shawl's pattern. I chose some small opalescent beads, then a larger opalescent that has been silvered in the bead's centre. It sparkles as it catches the light! A simple arrangement of four small, one large and a final small to catch and hold the grouping, between each fringe bout. Its centred so it will be equally viewed no matter which side of the shawl is facing out. Again if you are new, check here on my beading technique. I thought it best to keep it simple given the complex nature of the pattern (see Melinda's shawl, parts 1, 2 and 3 under 'topic shopping' on the right hand side bar) as it also gives the owner more options for what to wear with it. It's a large piece so after its soaking and gentle squeezing out, I hung it outside over a PVC rod to drip dry. I gently tugged it into shape and untangled the fringe. It was a bright sunny day but under the deck it was difficult to get a good shot. Tickling the picture up later was made harder to do because the background is so much brighter. Happily, no such camera issues once pressed and hung on Madge Manikin (sure wish she had arms!) The sheen is lovely! The sett was perfect. Looks very much like the last one that went to my sister, hence deja vu all over again. This time there is a big difference! The *feel*. I wish I could share that with you. Its incredibly soft and a delight to touch. As you can see, it drapes beautifully as well. 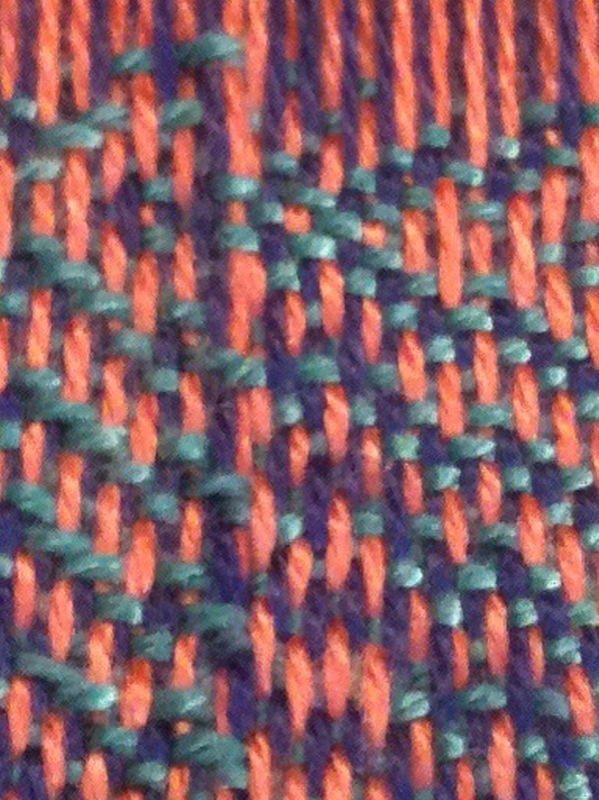 The silk seacell weft gave the shawl a much creamier colour. Do you find that you are amazed at what we can create with our hands? Every now and then a piece hits me just like that.